Results: Humberto Velazco defeats Thomas Williams Jr. 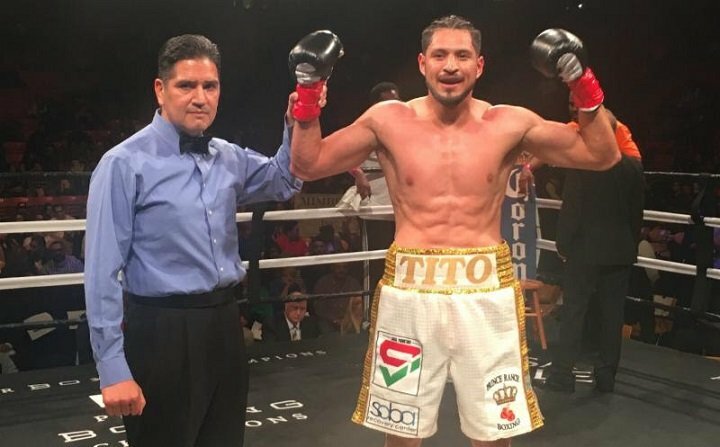 This past Saturday, at the Don Haskins Center in El Paso, TX, Sugar Promotions light-heavyweight prospect, Humberto “Tito” Velazco (19-1-1, 14 KOs), scored the knockout of the night, against Thomas “Top Dog” Williams Jr. (20-4, 14 KOs). Velazco, who hails from Aguascalientes, Mexico, rallied from an early first round knockdown, which was more of an off-balance circumstance. Velazco wasn’t hurt and evened the score in the second round with his own knockdown, catching Williams with a short right to the face, a punch he didn’t see coming. Williams survived the round but was walking on wobbly legs. Now in a rhythm, Velazco’s timing was on point as he sent Williams to the deck for the second time in round three, this time hurting him badly with combination of punches. Williams survived once again only to be stopped in round four when Velazco, a heavy-handed southpaw, blasted him with a straight left, forcing the referee to stop the bout at the 1:37 mark. A genetic freak, Velaszco stands slightly over 6″1, and has a rare combination of speed and power. His athletic pedigree runs in the family as his brother is a professional basketball player. Next boxing news: 1st USA Boxing Alumni Association Event in N.E. You are here: Home / Boxing Results / Results: Humberto Velazco defeats Thomas Williams Jr.